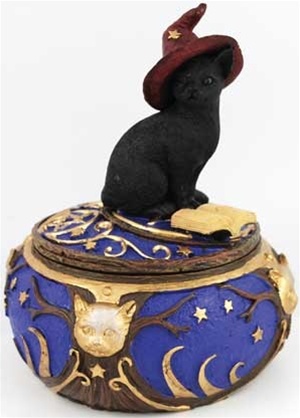 An absolute delight for collectors of cats and kittens as well as those who simply enjoy traditional, pagan imagery, this handy little jar is decorating in swirling patterns of stars and moons and pentagrams, and accented by a black cat sitting atop its lid, wearing a broad-brimmed, pointy hat and seemingly looking up from reading a magical tome. With the rest of the jar colored in tones of blue and gold, it is a wonderful piece for the altar, desk, or anywhere else you can imagine it. Made of cold-cast resin, this jar sits approximately 5" high at its highest, though the actual container measures only 1 3/4" tall and 4 1/4" in diameter at its widest point.